I decide to check on Ryan. It is after school and Ryan has been playing in our fenced in backyard for the past 10 minutes. I usually peek out of the window every so often to make sure he’s o.k.. I scan the backyard. He’s no where in sight. He’s probably hiding behind the shed. I walk out the door and onto the deck. I look toward the shed and he’s not there either. Then I see the gate to the fence is open. The gate is NEVER open. It’s ALWAYS locked. I begin to run. I run through my next door neighbor’s backyard, then my next neighbor’s yard. I run down the hill and up the street. He’s not anywhere I look. This is the second time Ryan has bolted. The first time was before Christmas at school. He was on the swing at recess, and suddenly decided to run off the playground. He’s fast. His teacher started chasing him. The other teacher called for help on the walkie-talkie. Before long, the principal, assistant principal, and another teacher were outside searching the area around the school. They finally found him hiding behind a bus in the bus lot. I don’t know how long he was gone. I really don’t want to know. I don’t want to think about the busy street in front of the school or the deep woods behind the school. Ryan has no sense of fear. He doesn’t understand that cars won’t stop for him if he runs into the street. He doesn’t understand that he could get lost or not be able to find his way back. Ryan ended up in the principal’s office, which made no difference to him. He doesn’t understand the stigma of going to the principal’s office. In fact, he thinks going to the principal’s office is fun. I give the principal and his teacher credit for trying to make him understand how dangerous it was for him to run from the playground. I don’t think it sunk in. Ryan now has recess on the kindergarten playground since it is totally fenced in. The school can’t completely fence in the second grade playground because it would be too expensive. But that’s a whole other story. Today, as I look for Ryan, a million things go through my mind at once. He could be anywhere, in anyone’s yard, behind any tree, in the middle of the woods, in the middle of a busy street. I know that time is ticking. I try to figure out the best way to find him. I’m out of breath and realize running from house to house is not the most efficient use of my energy. Should I call 911? Should I get in my car? Should I call my neighbors? Then I see the boy from next door walking down the street. The middle school bus just dropped him off. I ask him if he saw Ryan. He did, way at the top of the hill, almost a half mile away, standing behind a car parked in the street. I run into the house for my keys. It seems like it takes forever to dig through my purse to find them. I sprint to the car, back out of the garage, and head down the street. Then up ahead I see Ryan running toward my car. Behind him are two girls and their dad. The girls also just got off the bus. They saw Ryan, recognized him from church, and started following him. Thank God they decided to follow him. I stop the car and run over to Ryan. I’d give him a big hug but he always pulls away. I grab onto his hand instead. I hurriedly explain the situation to my neighbor, how Ryan has the tendency to bolt, and that we have safeguards at our house. The gate in the backyard is always locked. It was open today. Another woman pushing a child in a stroller joins the group. She reports that Ryan had gone into someone’s mailbox, pulled out the mail, and threw it on the ground. Yes, Ryan is obsessed with mail trucks and mail right now. She says that she saw him run the whole way down the other street. Her voice sounds critical. And why shouldn’t she be? Wasn’t I just as critical of the mother of the boy in California who ran out of the house in the dead of winter with no coat or shoes? And the ending was not a happy one. Didn’t I criticize her to myself and wonder how any mother could not watch her child better than that? It only takes a minute when a child has a tendency to bolt. We have our garage door button covered up so Ryan can’t open the garage door. We have extra locks on our doors. The fence gates are always shut and he can’t open them. Or are they? It only takes a minute. . .. I put Ryan in the car and drive him back home thinking all the way that he’s older and bigger now. He has a mind of his own. And he’s smart. If he wants to run, he’ll find a way. I tell him that he’s not allowed to leave the house or backyard without Mommy or Daddy. I ask him if he understands and he says yes. But he still doesn’t seem to get the enormity of what he did or how much danger he was in. Again, I thank God that nothing bad happened, and realize that each passing day will continue to bring new and challenges and that we’ll always have to stay one step ahead. Ryan’s I.E.P. (Individual Education Plan) meeting was yesterday. We sat at a long rectangular table in the conference room of the school with the school psychologist, the speech teacher, the occupational therapist, the general education teacher and the special education teacher. I always feel a little intimidated at these meetings. But usually I’m glad if the meeting goes quickly, if I’m feeling impressed with how Ryan is meeting his goals, or if we’re all in agreement about the coming year. But this year is different. Trying to navigate through all the options and what’s best for Ryan is hard. We want him to spend more time in the general education classroom. But is Ryan ready?Especially troubling is the number of prompts Ryan needs to complete his work and follow the teachers directions. He understands everything he’s supposed to do, but won’t do it without extra prompting. Ryan is lost when presented with whole group instruction. Somehow, in his mind, the whole group doesn’t include him. When the teacher says “Class, turn to page 20,” it doesn’t register to Ryan that he is also a part of the class and needs to follow the directions. And he hates anything that requires a lot of writing. Ryan’s writing is large and sometimes hard to read. Math isn’t Ryan’s favorite subject since it’s abstract. But he’d do better if the new common core math didn’t require him to write out all the numbers in expanded form, draw hundreds, tens and ones blocks, and make grids and columns. Ryan often lacks motivation to complete work or tests if it’s not interesting to him, which is common among children with autism. Wanting to do well on a test to please others is a highly social concept. Ryan doesn’t care what others think. So it’s hard to assess what he knows. Until the day he blows everyone out of the water with a connection he made to a story he read two weeks ago, or he actually felt like taking a test that day and got a good grade. Ryan has some strong academic skills. He reads on the fifth grade level and remembers every fact that he hears. You can’t remember the name of a store or the title of a book? He’ll tell you. He learns quickly when he’s interested and is paying attention. So where do we go from here? Do we hope maturity will eventually set in and he’ll suddenly understand what he needs to do to succeed in a general education classroom. Does he need more one on one or less one on one? Has he become dependent on extra help or is it something he needs? The next step is for Ryan to do a five week trial with a math class and a reading group in the general education classroom. In the mean time, the school psychologist will be giving Ryan the VB-MAPP test (Verbal Behavior Milestones Assessment and Placement Program) for children with autism. The five components of the test should be able to show us where he stands with his language and verbal skills, if he has acquired the skills necessary to learn in a less restrictive environment, and what goals need to be placed on his I.E.P. so he can be ready for inclusion. 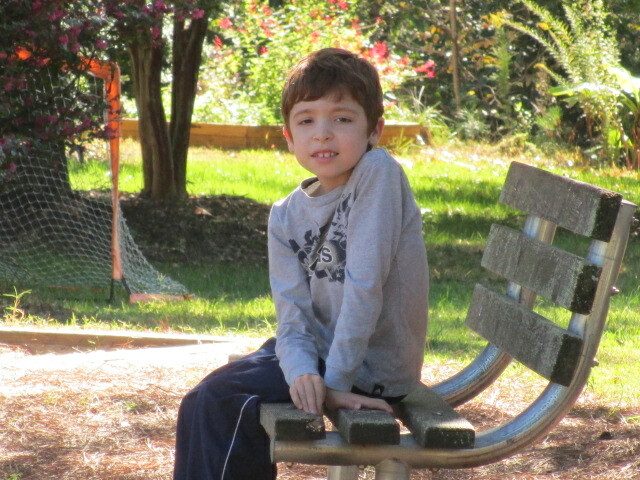 I’m hoping when all the assessing is done, the school and I will be in agreement about what is the next step for Ryan. But what if we disagree? Who will win in the end? If this post sounds confusing, it’s because the whole I.E.P. process is. It’s a stressful and difficult time for parents who want what’s best for their child. If only we had a crystal ball and could look into the future and see what is the best path to take. The worst feeling is regret over not going in a certain direction. So we just keep moving on, gathering more information, waiting and watching, and hoping that it all becomes clear in the end. Categories: Uncategorized | Tags: aspergers, autism acceptance, autism awareness, children with autism and school, IEP meetings | Permalink.